This past week I pulled together some Color Matching Cards for Kaleb to practice matching his colors, naming/identifying objects. You can print the cards off using by clicking on the thumbnail image below. There are 10 pages/colors shown in this set with 6 cards on each page. One of the cards shows a 'base' color. The base colors are red, orange, yellow, green, blue, purple, pink, brown, black and white. Print the sheets, cut and then laminate to make them more sturdy. Have your child find the five cards that match the base color shown. If your child is just learning his colors, use only one or two sets at a time and then add more colors in as he begins to sort colors correctly. Click on the thumbnail above to download a copy. Please feel free to print the pdf file for your own personal use. They were created for private and non-profit use. You are more than welcome to link back to this post. Thank you so much for sharing these. Beautiful work! These look bright, colorful and fun! I'm printing them right now. Thanks! I think the bright pics you have used make the game so attractive for kids! I will deffinatley print these out!!! The pictures are Beautiful! And what a fun way to practice colors and to talk about different objects. You could also do a living and Not living lesson! These cards are beautiful! Thank you for sharing. Where do you get your pictures? Wonderful!!! I'm sure my little fellow will enjoy these! Thanks so much for sharing!!!! I'm happy to have linked to your site this morning. I think I'm going to like it here : ) I can't wait to replace the ink in my printer and make these cards. These are awesome! I've been trying to figure out a good way to teach my 18 month old about colors & I think this will be great! I love these cards!! Thanks so much. I am so excited about using them with my pre-k class. I was wondering you one had one for gray, as well. Thanks for creating such a fun activity! I posted a comment on the Alphabet cards as well, but I thought I'd put one here too since it is a more recent post and others may benefit from the ideas below...which are not mine. and I have been looking for a great bunch of pictures to go along with it. If I waited until I gathered my own pictures from around the house she'd be in 7th grade before I finished the project. I hope others try to make the same set of cards although even on card stock these are great. Thank you so much. Your colors and pictures are purely gorgeous and my older kids love them, too. 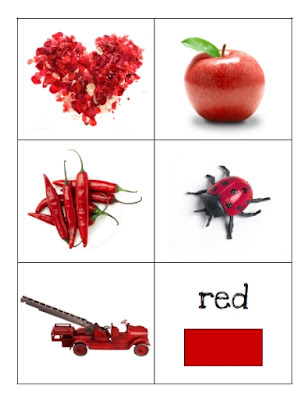 I wasn't able to print this colors cards and neither the beggining consonant cards. i'd like to have them if it is possible.thanks. Patricia ~ I'd love to help you, but I don't have a way to contact you. The pdf files open for me right now, so I'm not sure what is happening. If you could email me directly that would be great.